Before you give up on your recovery routine entirely, we're about to make it easier for you to manage. While both foam rolling and stretching have their merits, if you've only got time for one, you should grab your trusty foam roller. 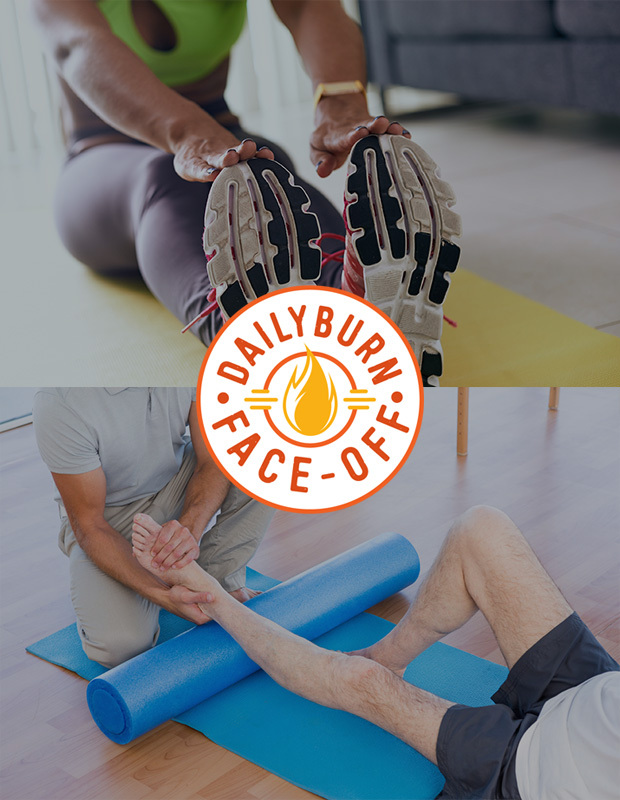 A health, fitness and lifestyle site brought to you by Daily Burn. You know you're supposed to be foam rolling and stretching your muscles, to keep your body strong and healthy. But what if you can barely squeeze in your workouts in the first place -- let alone 10 extra minutes at the beginning and end of each session? Before you give up on your recovery routine entirely, we're about to make it easier for you to manage. While both foam rolling and stretching have their merits, if you've only got time for one, you should grab your trusty foam roller, says DailyBurn Fitness/Nutrition Coach Sarah Snyder. "Foam rolling gives you all the same benefits of stretching as well as added benefits," she says. Here's why foam rolling comes out on top and how to do it right. No matter how eager you are to start (or finish) your workout, it's important to resist the urge to jump straight in without warming up your muscles, Snyder notes. But, we're officially giving you permission to scrap the minute-long hamstring holds you've been doing pre-run. "When you're stretching a cold muscle, your body goes into defensive mode, and what happens is your workout performance is hindered," Snyder says. Static stretches can essentially "freeze up" your muscles, preventing you from getting a full range of motion when you're on the move, and potentially leading to injury. That's why foam rolling before a workout can be a better use of your time. "The techniques you have to use for foam rolling help engage your muscles, so you're already doing a little bit of exercising when you're warming up with foam rolling," Snyder says. Bonus points if you can add some dynamic movements to your warm-up as well. After a workout, it may be tempting to collapse into a sweaty heap. But your body can reap real benefits from taking a few minutes to relieve the tension built up in your muscles. And while static stretches post-workout may help lengthen muscle and improve flexibility, foam rolling does all this and more by also targeting and relieving tension in the myofascial layer of your body. "Stretching doesn't get the myofascial layer, the connective tissue that is protecting all of your muscles," Snyder says. "With foam rolling, you're able to break up some of the tension there that has built up." While you've probably been stretching since sixth grade gym class, foam rolling is new to many people. But a few simple techniques will help make sure you're rolling right, Snyder says. Relax. "Sometimes, when you're going over some of those areas that are tender, you tend to tense up," Snyder says. "Try to relax." As you're foam rolling, concentrate on keeping your shoulders pulled away from your ears. Reminding yourself to inhale and exhale while you roll will also help ensure your muscles stay loose, too. Engage your core. As with any other exercise, you'll want to keep your core tight and engaged while foam rolling, Snyder says. This will help ensure your hips aren't sagging and throwing your alignment out of whack. Pay attention to pain. We're not going to lie; foam rolling doesn't always feel great. After all, it's not easy to work out kinks in your muscles. (Ever gotten a deep tissue massage? Ouch.) But if you ever start to feel serious pain, it's time to stop, as you can make an already-aggravated area worse. "Another tip is to make sure you don't roll over your joints or bones," Snyder says, noting that putting undue pressure on your joints could cause injury. Roll slow. You only want to move about one inch per second while you're using this recovery tool, Snyder says. Aim to spend about one to two minutes targeting each muscle group, rolling fully up and down the length of the muscle about four times. The bottom line: "After a workout, in an ideal situation, if you did foam rolling and stretching that would be great," Snyder says. But if you're short on time, scrap the stretching and dedicate yourself to your foam roller instead.